Emollients, topical corticosteroids and avoidance of triggers remain the mainstays of treatment in children with eczema. Under-use of topical treatment continues to be more of a concern than overuse. This highlights the importance of providing comprehensive education to the child’s parents or caregivers and overcoming “corticosteroid phobia”. Although most children with eczema can be managed with topical treatments in primary care, referral to secondary care may be required in severe cases. Eczema, also referred to as atopic eczema or atopic dermatitis, is an itchy inflammatory skin disease most commonly seen in children. It is characterised by pruritis and inflamed, dry, scaling and crusted skin in the acute phase (Figure 1) with lichenification (thickening) and hyperpigmentation of the skin if the condition becomes chronic. Children with eczema will usually experience recurrent flares. The diagnosis of eczema in children is usually based on the patient history and clinical signs, e.g. dry, itchy skin and an early age of onset.2 After a diagnosis of eczema has been made, treatment is tailored to the severity of the child’s symptoms (Table 1). Providing educational materials about eczema to parents or caregivers can help to increase their knowledge about their child’s condition, and therefore reinforce effective management and help to promote adherence to topical treatments. Practice nurses are often responsible for this education and ongoing support. Warm (not hot) baths, once daily, lasting no longer than 10 – 15 minutes are recommended for all children with eczema.8 Emollients or wash-off emollient products, rather than soaps or detergents, should be used when bathing, and bubble baths avoided. Aqueous cream BP and emulsifying ointment BP (both subsidised) can be used as soap substitutes during bathing. * These products can also be used as wash-off emollients if the household does not have a bath, applied before the child enters the shower and then washed off. * Neither aqueous cream BP nor emulsifying ointment BP should be used as a leave-on emollient as both contain sodium lauryl sulphate and can irritate the skin (see: “Which emollient should be prescribed”). Twice-weekly antiseptic baths with diluted sodium hypochlorite (household bleach) can reduce staphylococcal carriage and improve the child’s symptoms.9 Parents can be advised to add 2 mL of plain bleach (2.2% sodium hypochlorite, e.g. “Budget Household Bleach Regular”) per litre of bathwater and bathe the child for 10 – 15 minutes, twice a week. A full-sized bath with a 10 cm depth of water holds approximately 80 litres of water, and will therefore require approximately 160 mL of 2.2% bleach. A baby’s bath holds approximately 15 litres of water and will require approximately 30 mL of 2.2% bleach. Parents should be advised that bleach baths are safe when the correct amount of bleach is added to the bath, but to avoid contact between the bath water and the child’s eyes. Antiseptic bath oils, e.g. Oilatum Plus or QV Flare up, can be used instead of bleach, but are generally more expensive. 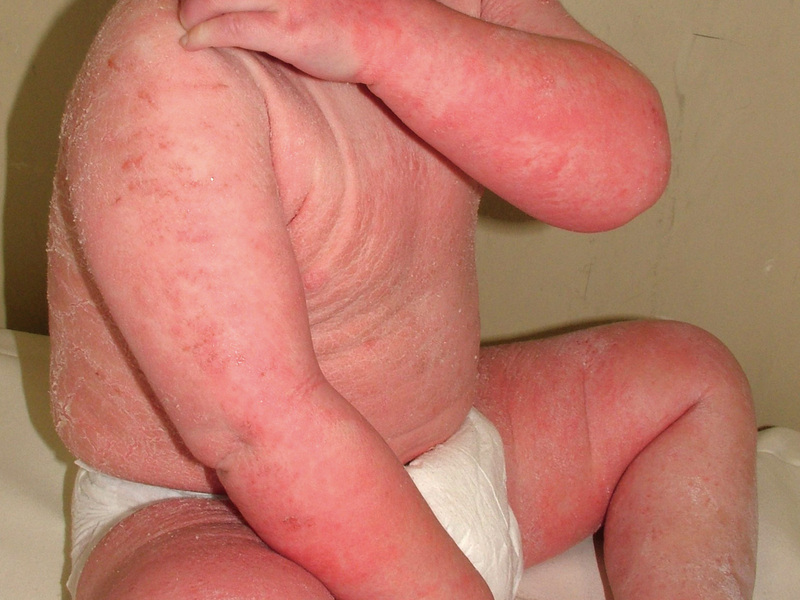 After bathing, the child should be rinsed off with fresh water and patted dry with a towel, followed by application of emollients and topical corticosteroids. * The EASI score is a tool used mainly in a research setting to measure the extent and severity of a patient’s eczema. Use mild detergents labelled for sensitive skin when washing clothes and do a second rinse cycle to remove residual detergent. Avoid the use of fabric softeners. If food allergy is suspected in a child with eczema, discussion with an immunologist, paediatric dermatologist or paediatrician is recommended, to decide on a course of further investigation, which may include radioallergosorbent test (RAST) or skin prick testing.12 These tests can be performed in primary care, but results can sometimes be misleading or difficult to interpret. For further information, see: “Appropriate use of allergy testing in primary care” (Best Tests, Dec 2011). Where possible emollients should be dispensed in a pump container or tube, as emollients prescribed in tubs or jars can become contaminated.8 If tubs or jars are dispensed, advise carers to scoop the emollient from the tub using a clean spoon or spatula to avoid bacterial contamination. Children should be encouraged to apply their emollients themselves from a young age, as this helps adherence and self-treatment when they start attending school. School-aged children should ideally keep a supply of emollient at school and be encouraged to use it whenever they feel the urge to scratch. Best practice tip: when prescribing an emollient it is useful to put the monthly quantity of emollient required on prescription (i.e. 2000 g per month). As most subsidised emollients are “stat” dispensed, the pharmacist is generally obliged to give the entire three months supply at the same time. However, if the prescriber wishes to limit the initial supply this can be achieved by endorsing the prescription with “trial period one month”. 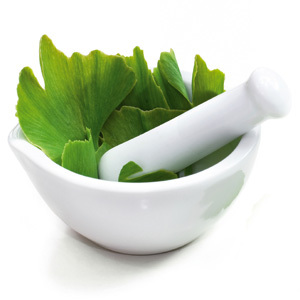 Which emollient should be prescribed? The best choice of emollient is the one preferred by the child/parent as it is more likely to be used regularly. Emollients have different formulations, including ointments, creams and lotions. The difference is the proportion of oil (lipid) to water in the product. The lipid content is highest in ointments, intermediate in creams and lowest in lotions. As a general rule, the products with the highest lipid content are more effective in treating dry skin, provide better barrier protection and have a longer duration of action,12 but may be the least convenient due to being the most greasy/sticky on the skin. The current subsidised emollients include three products that contain cetomacrogol derivatives and are considered as slightly-to-moderately greasy creams. These are Fatty Cream (HealthE) and cetomacrogol cream (PSM) which are available in 500 g tubs, and Sorbolene cream (which contains cetomacrogol + 10% glycerol) which is available in 500 g and 1 kg pump dispensers. Other products are available to purchase if the child or parent prefers another formulation. Aqueous cream BP and emulsifying ointment BP should not be used as leave-on emollients. Flares are characteristic of eczema, despite efforts to avoid irritants and apply emollients frequently. 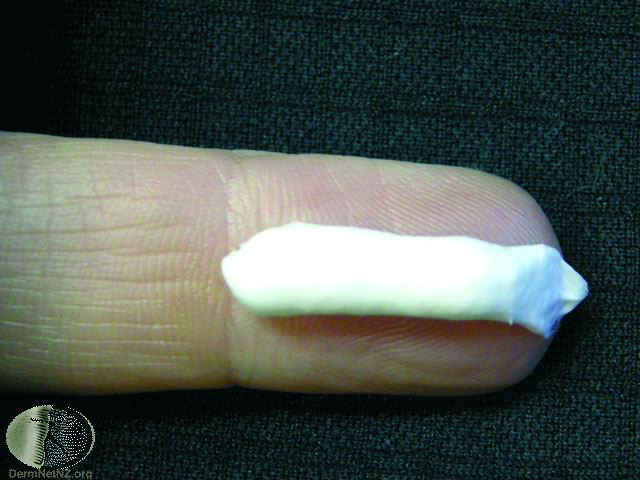 Topical corticosteroids are effective for treating flares, and, when used correctly, result in minimal adverse effects.17 As with emollients, underuse of topical corticosteroids is more common than overuse, and discussing the benefits and risks of topical corticosteroid treatment with the family can assist in overcoming “corticosteroid phobia” (see: “Overcoming corticosteroid phobia”). The potency of the corticosteroid prescribed should be matched to the severity of the child’s eczema flare (Table 1) and the area of the body affected. It is important that the child’s parents are aware of what area of the body the topical corticosteroid should be applied to, particularly if more than one topical corticosteroid has been prescribed, e.g. hydrocortisone for the face and a more potent corticosteroid for eczema on the body. Best Practice Tip: Note on the prescription the specific area to which the cream needs to be applied, as this will then be put on the dispensing label by the pharmacy. Are there any general rules to follow when selecting the appropriate potency? How often should topical corticosteroids be applied, and for how long? Topical corticosteroids should only be applied to areas of active eczema (including broken skin) and usually discontinued when the flare has resolved (see: “Weekend treatment”).8 The treatment duration is usually less than two weeks and if the flare does not resolve in this time then the treatment should be reassessed (see below). How much topical corticosteroid should be prescribed? An adult fingertip unit (FTU) should be used as a guide when prescribing topical corticosteroids and when advising parents about appropriate use (Tables 3 and 4). One FTU is the amount of product (approximately 3 cm or 0.5 g) that will cover an adult index finger, from the tip of the finger to the distal interphalangeal joint, from a tube that has a standard 5 mm nozzle (Figure 2).19 As a general guide, one adult FTU is enough to treat an area of the child’s eczema equal to the surface of two adult hands held side by side with the fingers together. Explaining to parents that topical corticosteroids have an anti-inflammatory effect, and are different to anabolic steroids, can also assist in overcoming any steroid phobia the parents may have. Emollients and topical corticosteroids are the evidence-based core treatments for children with eczema, however, other treatment options may be considered in certain circumstances. 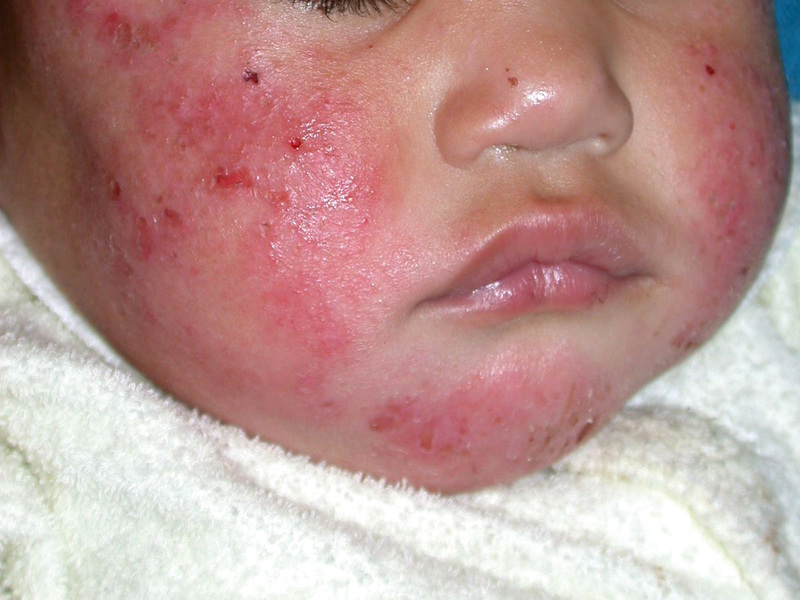 Children with infected eczema require treatment with an oral antibiotic. The antibiotic regimen should be selected based on local resistance patterns and be active against S. aureus and streptococci. Skin swabs can be considered in certain circumstances, e.g. in areas with high prevalence rates of methicillin-resistant S. aureus (MRSA) or in children who have failed to respond to the first-line antibiotic treatment. Flucloxacillin syrup can be unpalatable for some children, therefore those who can swallow capsules should be prescribed these in preference to the syrup. It is not recommended that the syrup is mixed with other liquids prior to administration to help improve the taste, but a sweet drink can be given afterwards. As cephalexin is a broader spectrum antibiotic than flucloxacillin, ideally it should be chosen second-line, however, if compliance with flucloxacillin will be problematic, it is a recommended option. Prescribing topical antibiotics, e.g. fusidic acid, for children with small localised lesions of infected eczema is now generally not recommended due to the high rates of resistance to fusidic acid in the community. Combination steroid, antibiotic and antifungal creams, e.g. Pimafucort (subsidised), may be appropriate for localised infections in certain circumstances, e.g. children with angular chelitis. Best practice tip: If a child is being prescribed a sedating antihistamine “as required”, ensure that an appropriate volume of medicine is indicated on the prescription. In the past, wet wraps have been recommended to parents as an at-home treatment for children with severe or extensive eczema. However, they are now generally not recommended for use in an outpatient community setting as the benefits of wet wraps over appropriate use of topical corticosteroids has not be proven.8, 27 Wet wraps have a number of drawbacks including systemic absorption of corticosteroids, high cost, necessity for specialised training to apply the wraps effectively and safely, and an increase in cutaneous infections and folliculitis.12 They are sometimes used in a hospital setting under specialist supervision and require close monitoring if used with topical corticosteroids. If the eczema is severe (or on the face) and the child is not responding to topical corticosteroids. This includes children requiring ongoing daily use of topical steroids to maintain control. The guidance provided in this article is based on the best published international and local evidence for treating children with eczema in the primary care population in New Zealand. It is acknowledged that there are a number of alternative treatment options available, which, although do not have a solid evidence base to support them, may be considered on an individual basis in children for whom resolution of symptoms has been unable to be achieved with conventional means. These strategies often incorporate different combinations of treatments, other formulations/brands of emollients, the use of vitamins and exploring the avoidance of certain foods. An open and non-judgemental discussion about strategies the parents may wish to pursue can help to ensure that appropriate treatments are selected that do not adversely affect the child’s condition. Thank you to Dr Diana Purvis, Paediatric Dermatologist, Starship Children’s Health, Honorary Senior Lecturer, School of Medicine, University of Auckland for expert review of this article. Clayton T, Asher MI, Crane J, et al. Time trends, ethnicity and risk factors for eczema in New Zealand children: ISAAC Phase Three. Asia Pac Allergy 2013;3:161–78. Starship Children’s Health. Diagnosis and assessment of eczema. 2014. Available from: www.starship.org.nz/for-health-professionals/national-child-and-youth-clinical-networks/eczema/diagnosis-and-assessment-of-eczema/ (Accessed Apr, 2015). Tollefson MM, Bruckner AL. Atopic dermatitis: skin-directed management. Pediatrics 2014;134:e1735–44. McAleer MA, Irvine AD. The multifunctional role of filaggrin in allergic skin disease. J Allergy Clin Immunol 2013;131:280–91. Elias PM, Steinhoff M. ‘Outside-to-inside’ (and now back to ‘outside’) pathogenic mechanisms in atopic dermatitis. J Invest Dermatol 2008;128:1067–70. National Institute for Health and Care Excellence (NICE). Atopic eczema in children: management of atopic eczema in children from birth up to the age of 12 years. NICE, 2007. Available from: www.nice.org.uk (Accessed Apr, 2015). New Zealand Formulary for Children (NZFC). NZFC v34. 2015. Available from: www.nzfchildren.org.nz (Accessed Apr, 2015). Starship Children’s Health. Guidelines for the outpatient/primary care management of childhood eczema. 2014. Available from: www.starship.org.nz/for-health-professionals/national-child-and-youth-clinical-networks/eczema/guidelines-for-the-outpatient-primary-care-managment-of-childhood-eczema/ (Accessed Apr, 2015). Wong S, Ng TG, Baba R. Efficacy and safety of sodium hypochlorite (bleach) baths in patients with moderate to severe atopic dermatitis in Malaysia. J Dermatol 2013;40:874–80. Herd MJ. A pilot study of dilute bleach baths in children with atopic dermatitis. Personal communication prior to publication; 2015. Waitemata District Health Board. Eczema in children - a topical issue. 2014. Available from: www.saferx.co.nz//full/eczema.pdf (Accessed Apr, 2015). Starship Children’s Health. Eczema. Starship Clinical Guidelines, 2014. Available from: www.starship.org.nz/for-health-professionals/starship-clinical-guidelines/e/eczema/ (Accessed Apr, 2015). Sinclair J, Brothers S, Jackson P, et al. IgE-mediated food allergy-diagnosis and management in New Zealand children. N Z Med J 2013;126:57–67. Bath-Hextall F, Delamere FM, Williams HC. Dietary exclusions for established atopic eczema. Cochrane Database Syst Rev 2008;(1):CD005203. Mason JM, Carr J, Buckley C, et al. Improved emollient use reduces atopic eczema symptoms and is cost neutral in infants: before-and-after evaluation of a multifaceted educational support programme. BMC Dermatol 2013;13:7. Grimalt R, Mengeaud V, Cambazard F, et al. The steroid-sparing effect of an emollient therapy in infants with atopic dermatitis: a randomized controlled study. Dermatology 2007;214:61–7. Mooney E, Rademaker M, Dailey R, et al. Adverse effects of topical corticosteroids in paediatric eczema: Australasian consensus statement. Australas J Dermatol 2015;March 6. Williams HC. Established corticosteroid creams should be applied only once daily in patients with atopic eczema. BMJ 2007;334:1272. DermNet NZ. Fingertip unit. 2014. Available from: www.dermnetnz.org/treatments/fingertip-units.html (Accessed Apr, 2015). Health Hawke’s Bay. Topical steroid use in atopic children. 2013. Available from: www.healthhb.co.nz/wp-content/uploads/2014/05/Topical-Steroid-Preparations-July-2013.pdf (Accessed Apr, 2015). Williams HC. Preventing eczema flares with topical corticosteroids or tacrolimus: which is best? Br J Dermatol 2011;164:231–3. Glazenburg EJ, Wolkerstorfer A, Gerretsen AL, et al. Efficacy and safety of fluticasone propionate 0.005% ointment in the long-term maintenance treatment of children with atopic dermatitis: differences between boys and girls? Pediatr Allergy Immunol 2009;20:59–66. Hong E, Smith S, Fischer G. Evaluation of the atrophogenic potential of topical corticosteroids in pediatric dermatology patients. Pediatr Dermatol 2011;28:393–6. Eichenfield LF, Tom WL, Berger TG, et al. Guidelines of care for the management of atopic dermatitis: section 2. Management and treatment of atopic dermatitis with topical therapies. J Am Acad Dermatol 2014;71:116–32. Schmitt J, von Kobyletzki L, Svensson A, et al. Efficacy and tolerability of proactive treatment with topical corticosteroids and calcineurin inhibitors for atopic eczema: systematic review and meta-analysis of randomized controlled trials. Br J Dermatol 2011;164:415–28. Clinical Pathways; Northern region. Guidelines for the assessment and management of recurrent skin infections in children > 3 months - 14 years. 2013. Available from: www.healthpointpathways.co.nz/assets/Paediatric%20Skin%20Infections/Guidelines%20for%20the%20assessment%20and%20management%20of%20recurrent%20skin%20infections%20in%20children.pdf (Accessed Apr, 2015). Oranje AP, Devillers ACA, Kunz B, et al. Treatment of patients with atopic dermatitis using wet-wrap dressings with diluted steroids and/or emollients. An expert panel’s opinion and review of the literature. J Eur Acad Dermatol Venereol 2006;20:1277–86. Rebekah Sands said: 8/08/2017 10:16:33 p.m. The Editor said: 9/08/2017 3:23:06 p.m.
Hi Rebekah. Sedating antihistamines are contraindicated in children aged under two years - this is based on information in the New Zealand Formulary for Children, medicine datasheets and a Medsafe advisory in 2013 - http://www.medsafe.govt.nz/profs/puarticles/mar2013childrenandsedatingantihistamines.htm We note that the Starship article you refer to was last updated in 2014 and the recommendation for use of sedating antihistamines in this setting is linked to a 2007 NICE guideline. It may be that the advice contained in the Starship guide is intended for use in a hospital setting. There may occasionally be clinical reasons for use of sedating antihistamines in children aged under two years, at the discretion of the prescriber.